Dieng Plateau is one of the strategic areas of national tourism in Central Java Province based on the National Tourism Development Master Plan. Dieng Plateau is one of the mainstay tourist areas in Central Java Province. Judging from the availability of tourist facilities in the area of ​​Dieng Plateau attractions are not in accordance with the needs of tourist areas. Therefore, this study aims to produce a description of the perception of tourists to tourism facilities resulting in needs, development priorities and levels of satisfaction and interests based on the perception of tourists. The identification of tourist perception toward tourist facility is seen based on the characteristics of tourists and the component of tourism object that is accommodation, food and drink facilities, shopping facilities, public facilities and tourist services. The analysis technique used is the standard of travel needs, Importance Performance Analysis and Customer Satisfaction Index. From the results of identification of tourist perceptions of tourism object facilities can be known that the facility has not been in accordance with the needs of tourist visitors and the level of tourist satisfaction to the facility so that the required improvement of the quality of tourism products. With reference to the assessment and analysis is obtained picture of the needs and perceptions of visitors to tourism facilities in the area of ​​Dieng Plateau attractions. ZEBUA, Fredy Noitolo. PERSEPSI WISATAWAN TERHADAP FASILITAS OBJEK WISATA DATARAN TINGGI DIENG PROVINSI JAWA TENGAH. Jurnal Planologi Unpas, [S.l. ], v. 5, n. 1, p. 897-902, mar. 2018. ISSN 2581-0081. 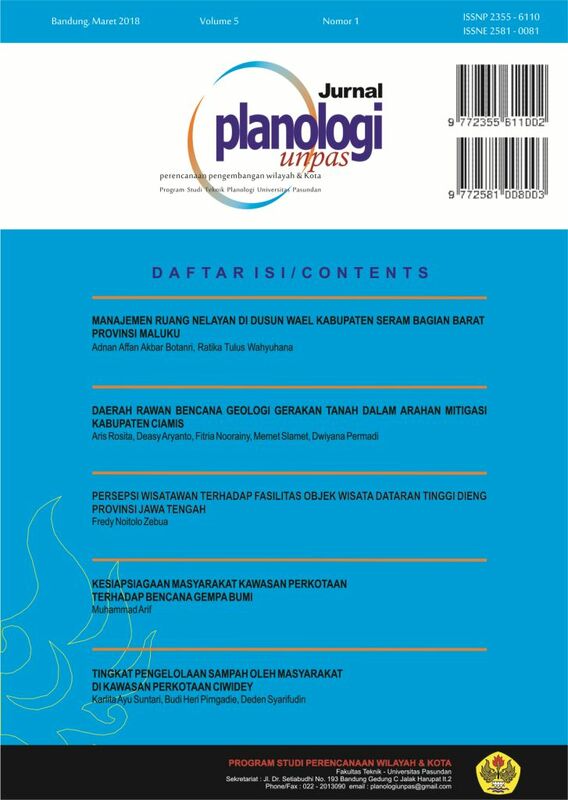 Available at: <http://journal.unpas.ac.id/index.php/planologi/article/view/926>. Date accessed: 25 apr. 2019. doi: http://dx.doi.org/10.23969/planologi.v5i1.926.